We Bought A House . . .
. . . which is why I’ve been so lax on the writing, blogging, tweeting, facebooking, and google-plussing (are these even words?) front over the last few days. Since we closed the deal and got the keys last Friday, it’s been all hands to the pumps—mowing grass, cleaning, painting, and doing some small fix-ups like fixing a broken door handle and getting the sprinklers working. So this is just a brief note while I sip the last of my coffee before I head back to the new place and carry on painting the porch. But I’m planning on being a bit more active on the Twitter front at least, while I do some more odd-jobbing. There might even be photos! Follow @PeteFordWriter as I take on the second coat, and maybe even scrub the garage floor. Go on, you know you want to. I finished the yard work about an hour ago, which is good news on several fronts. First and foremost, it’s done, and I don’t have to worry about it for a good while. Well, almost—there are a couple of weeds jammed between the deck and the fence, not easy to get to, but my back won’t stand for any more nonsense today; I’ll deal with those during the week. 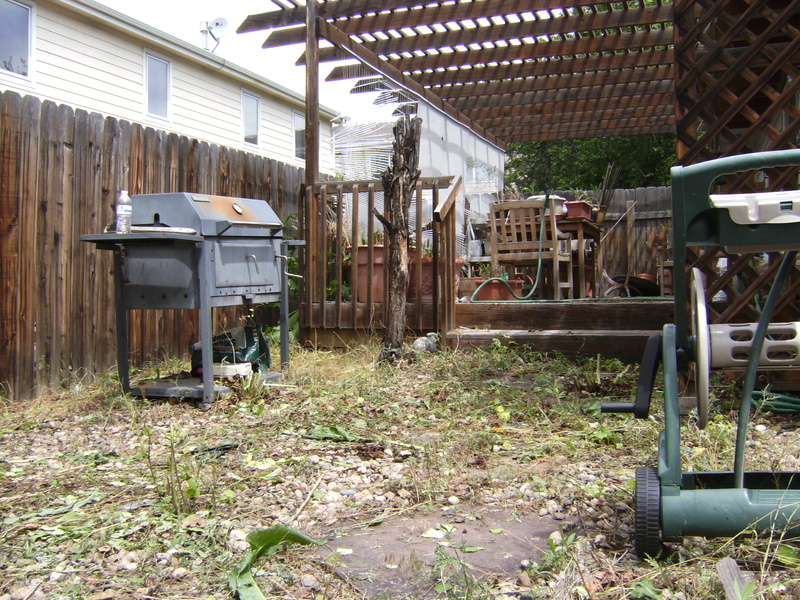 Second, this will be the last time I blog on the subject of yard word, which is good, right? In fact, even though those weeds will just grow back, and I’ll have to do this all again in a few weeks, I promise not to blog about it. So that’s where our BBQ grill was, all this time. The growth in that first shot came up incredibly fast—no more than three weeks, I think. 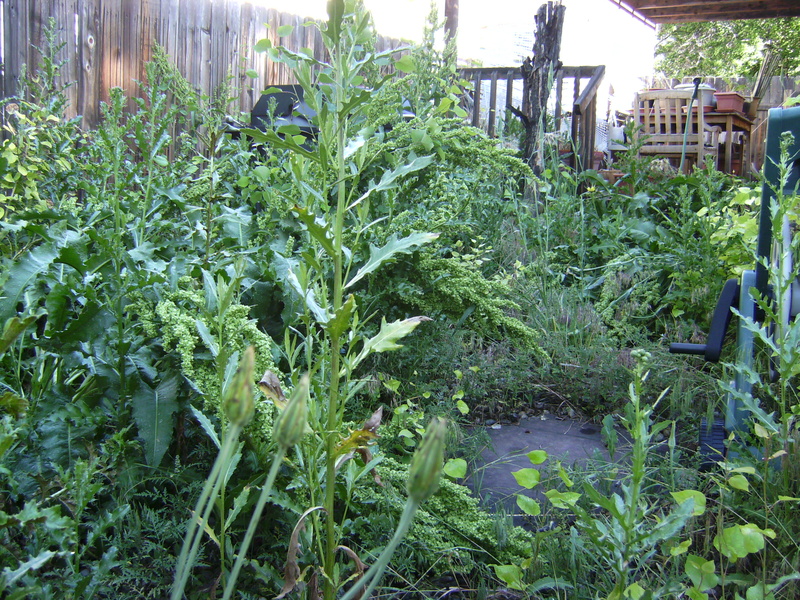 Some of those big, stinging weeds (like the one just left of centre) grew four feet in that time. In the hour since I finished, I’ve cleaned up, had a coffee and a couple of well-earned sausage biscuits as a late breakfast. Time for a break, then on with some editing. I’ve been back on the yard work, starting early while it’s cool. And wet. Yes, it rained last night (first time in weeks), so everything’s sodden, including me. I’m taking a breather break for a slurp of tea and to rest my back and hip (they’re giving me gyp already). Still, I’m about a third done. I’d have got further if not for the weed in the picture (this weed is #6 in a series of . . . well, a lot; I’m collecting the set, it seems). Heavy, fleshy green stuff on a fibrous endoskeleton that needs a machete to chop through. It can’t be reasoned with. It can’t be bargained with. It doesn’t feel pity, or remorse, or anger. 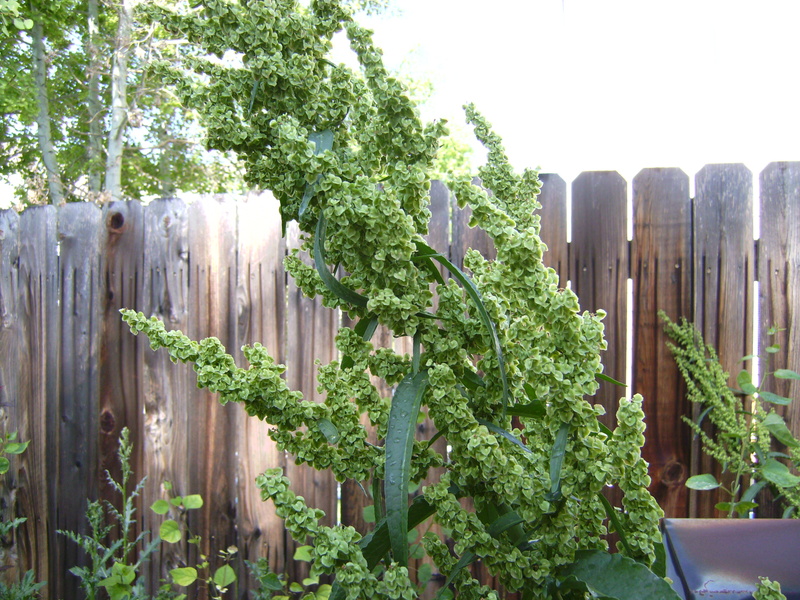 It is the T-101 of weeds. I’d better get back to it. Phased plasma rifle at the ready. Well, if I had one. Just what you see, pal. More later, including before-and-after pics. Following on from the previous . . . I marked off the area from the side gate to the back corner of the house as my target for today, which is about half the weedy area of the yard. Perfectly chosen, as it worked out: my back started to give out just as I was down to the last handful of weeds. Weeds ripped out: several hundred, possibly into the low four digits. Back-break factor: 50%, give or take. Sweat: I feel like I’m a quart low. Is it beer o’clock yet? Soil: gathered about half a pound. Could be worse. I need tea, a shower then food. I might get back to editing after that (I left off at a bit more than halfway through Chapter 7, so I’m not doing too bad), or I might kick back and watch some telly. Tomorrow, the other half of the weeding. Yard work. How I Just Loooove Yard Work. You can probably tell, from the way I wrote that title, that I’m not really a fan of yard work. To my wife, gardening is a fun thing to do. To me, it’s a chore involving breaking your back while getting covered in sweat, soil and spiderwebs. As far as I’m concerned, the perfect garden is made of concrete. But needs must, I suppose. Thanks to a couple of showers a couple of weeks ago, and heat and sunshine since, the yard at the side of the house is a mess. I mean, if you could hold it up, side-by-side, with a chunk of the Amazon rain forest, you’d have a job telling them apart. I’m putting on stout boots and gloves before I go out there. My wife thinks it’s in case there are rattlers hiding. In fact, it’s in case there are any Japanese soldiers in there, wondering if WWII is over yet. Enough of blogging while I procrastinate. Better get to it. The sooner I get done, the sooner I can get back to the important work. Later, friends . . .